Pack up the family or bring a friend, and join us for a day exploring Treat Island Preserve. 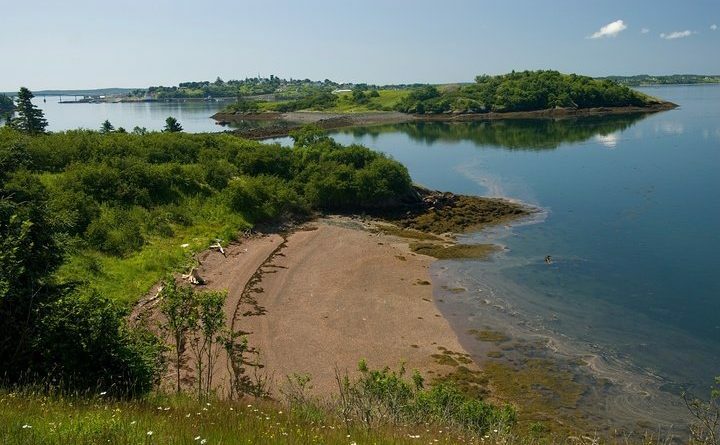 Acquired by Maine Coast Heritage Trust in 2009, Treat Island lies at the edge of easternmost Maine at the confluence of Cobscook and Passamaquoddy bays, a region known for its extreme tidal range, strong currents, and abundant wildlife. Treat Island has been a favorite destination for generations in the local community based on its exquisite beauty and close access from the mainland. Pack a picnic lunch and bring plenty of snacks! Take a hike or spread a blanket on one of Treat’s little pocket beaches and enjoy the magic of a September afternoon in Cobscook Bay. There will be plenty of time to explore the trails, beaches, and all the island has to offer. Look for ancient traces of use by Native Americans, cellar holes dating from the middle of the 19th century, and the ruins of a Civil War battery. Local legend includes stories of smuggling and privateering. Control of this region was contested by the British and the US for over a century and Treat Island was often at the center of it all! MCHT Washington County staffers Deirdre Whitehead, Melissa Lee, and Jacob van de Sande will join us and and be available to share their extensive knowledge of conservation efforts in the Cobscook Bay region. Steward Deirdre Whitehead will lead an optional history walk on the island and share her knowledge of the fascinating history of Treat Island.